The July 2017 meeting of the HPMS was called to order at 6:53 P.M. with 15 attendees. 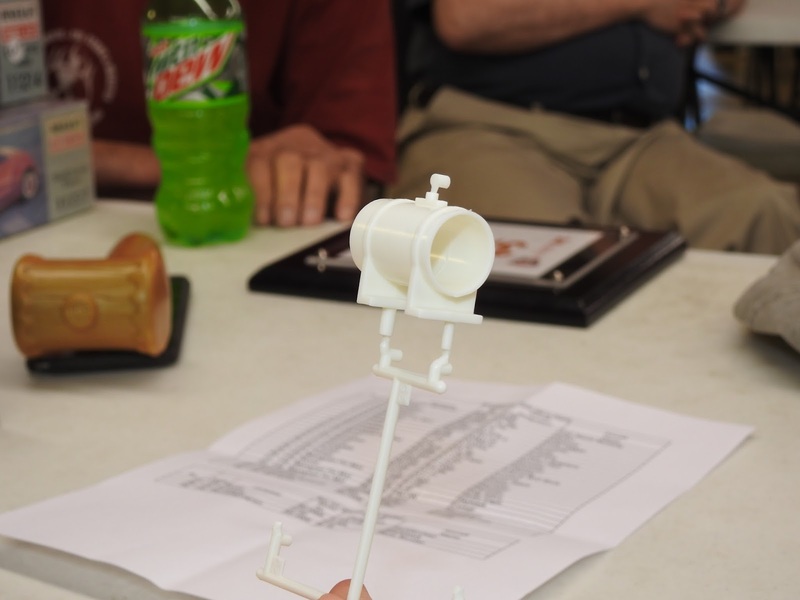 The subject of awards for the HPMS 2016 model show and contest was discussed and the decision was made to utilize a medallion type award. There will be three types, gold, silver, and bronze. This will correspond to first, second, and third place. This will cost between $442.00 and $515.00. The awards for best of show will consist of five acrylic type awards. There was discussion about a neck ribbon for the medallions and/or a case or pouch to hold them. The final decision was to add these items. An E-mail from Tom Clark has announced that the awards have arrived. There is now a table layout document available for viewing on the E-mail. The raffle was discussed. We have received a donation 17 helicopter from an individual, these kits are in various scales, unbuilt. The question of whether to buy further items for the raffle brought various views to the floor. 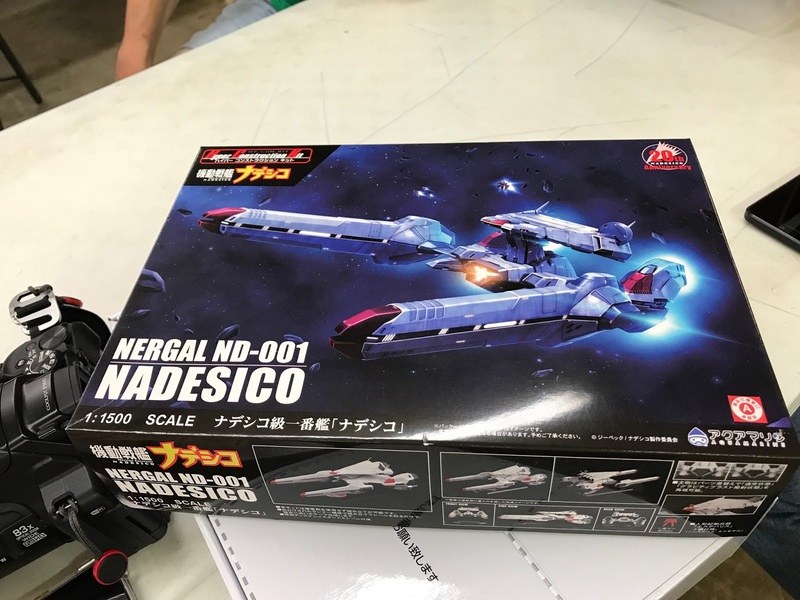 The chapter does not have any existing stock of kits and there was a feeling that we should not invest in further assets. The decision was made to discuss this further at the August meeting. Inventory of operational assets for the show is still open. The matter of a show banner for use in the JC building was discussed and tabled for the next meeting. 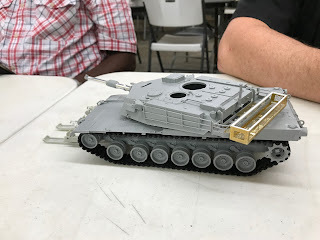 Based on E-mails, Skip was able to contact the Omaha IPMS chapter and we are sponsoring a trophy package. The category that we are sponsoring is 153 Rotary Wing (Civil or Military). 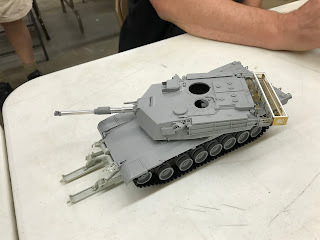 Our work at the Hamacon went well, we used up 18 of 24 'make & take' kits. The people in charge of Hamacon had allocated a table for us, but we did not man it. There was some problem with time hacks for the 'make & take' as three different documents indicated different times for the function. A gentleman came to our meeting with list of unbuilt kits that he has for sale. 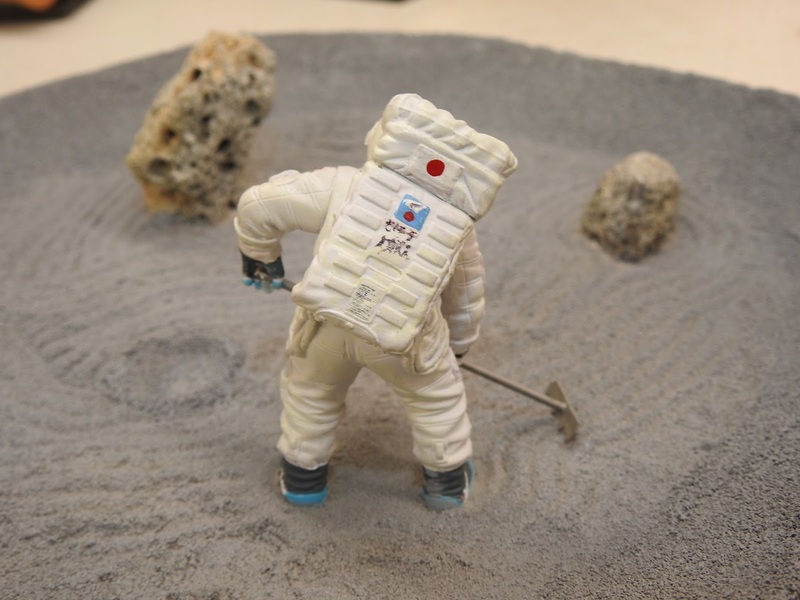 The list was passed around the table for the members to review. The subject of judges for the contest was brought up. There was a call for head judges, Tom Clark will be the head judge for the armor category and Ed Kiker will be head judge for the miscellaneous category. Further discussion of this matter was moved to the August meeting. Our chapter president requested that any members that needed name tags let him know and he will have them made. The insurance document from the nationals had not arrived as of the July meeting. Dave to look into it, may have gotten sent to the wrong E-mail. Four members of our chapter are going to the nationals in Omaha, have a safe trip, enjoy the convention, and you have many awards to bring back to Huntsville. A show report was given by our chapter president, Ed Maslin. 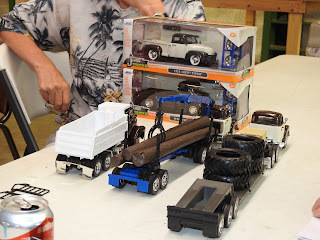 He went to a show in Memphis, was car models only which allowed for an extensive breakdown of the categories. 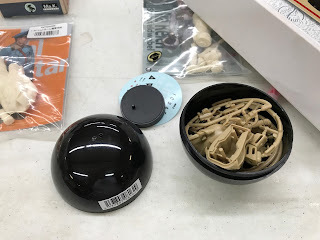 He showed the members an example for the awards they used, basically a wooden plaque base, onto which the certificate attached, covered a piece of clear Plexiglas, held to the base by four brass button head nails. Our chapter president, Ed Maslin, announced at this meeting that due to some problems he will not be president next. He will complete this years presidential term. 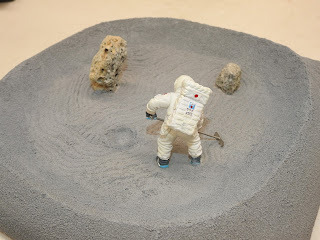 Ed Kiker - A diorama of a Japanese astronaut on the moon getting ready to take his T-Shot creating a karesansui, or zen rock garden, on the Moon. 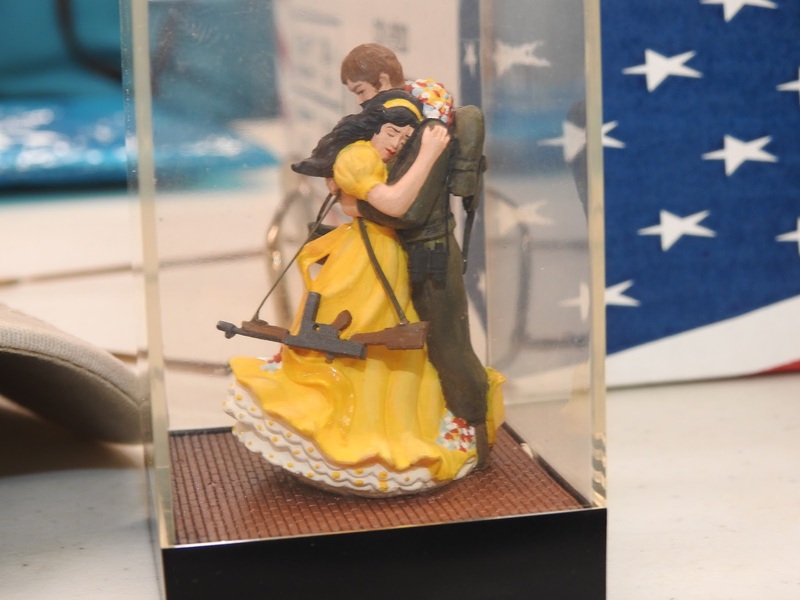 Ed also brought a figure set, modified from a wedding-cake topper into a "homecoming" vignette. 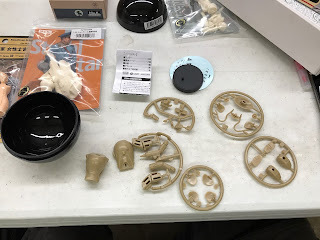 Ed Maslin - 1/16th scale 1931 Ford Sedan and Ford Roadster kits, plans to "mix and match". 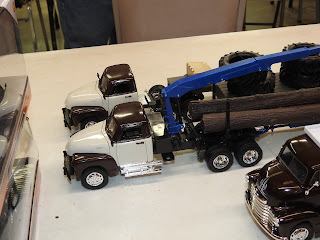 Alphie Onuszkanycz - 1/24th, 1/25th scale trucks - these are metal collector models, converted through the use of smaller scale chassis into tractors: a 1953 Chevy pick-up converted to a medium duty tractor truck;1953 Chevy pick-up converted to a log loader truck; 1952 Chevy cab-over-engine pick-up converted to a dump truck. He said these were for his 'garden' railroad layout. 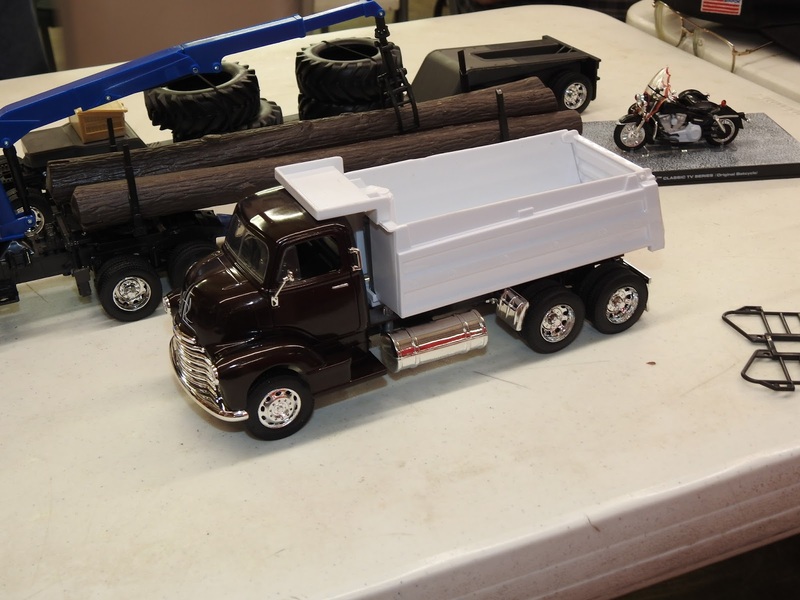 Andy Brezinski - Had examples of the styrene moldings from his latest Moebius Models 53-foot trailer model. 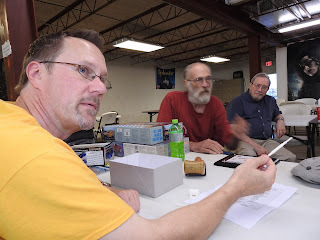 The June meeting of the HPMS was held on 5 June 20017 and was called to order at 7:00 P.M. There were 12 attendees. The subject trophies for this years model show and contest was brought up with the idea of an alternate style of trophy to last years paper awards. The idea of a medallion type of award with a case was mentioned. This would be similar to the type of award used at the Murfreesboro. There also the idea of making our own awards utilizing a 3D printer. But there was some question as to whether the quantity of trophies we need could be produced on the printer and questions regarding the cost of materials. The time factor was brought up as a decision will have to be made at the July meeting. Tom Clark volunteered to research this subject. There have been more vendor table reservations but no numbers were mentioned. Tom Clark needs to know the number of tables so he can generate to table set up map. 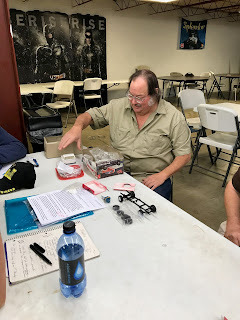 Kits for the show raffle were discussed. Due to the time factor obtaining prizes for the raffle is a priority. 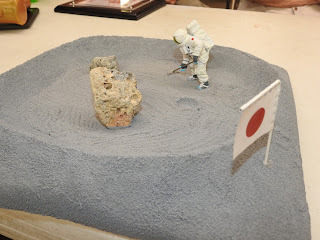 The situation of people removing their models from the contest tables before the placing of the ward for the model was mentioned. 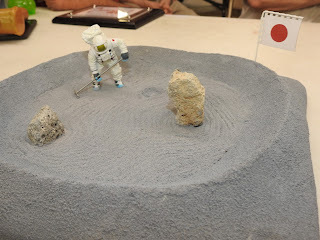 As the layout of the JC Building does not allow for the model display area to be closed off during judging it was decided that friendly reminders to not disturb the judges while they are doing their work and to please leave the models on the table so that the award can be placed with them would suffix. Inventory of operational assets for the show is still open. 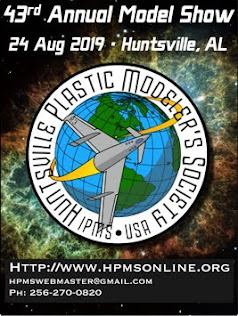 The subject of sponsoring a trophy package for the IPMS National Convention in Chattanooga, Tennessee in 2019 is to be tabled. 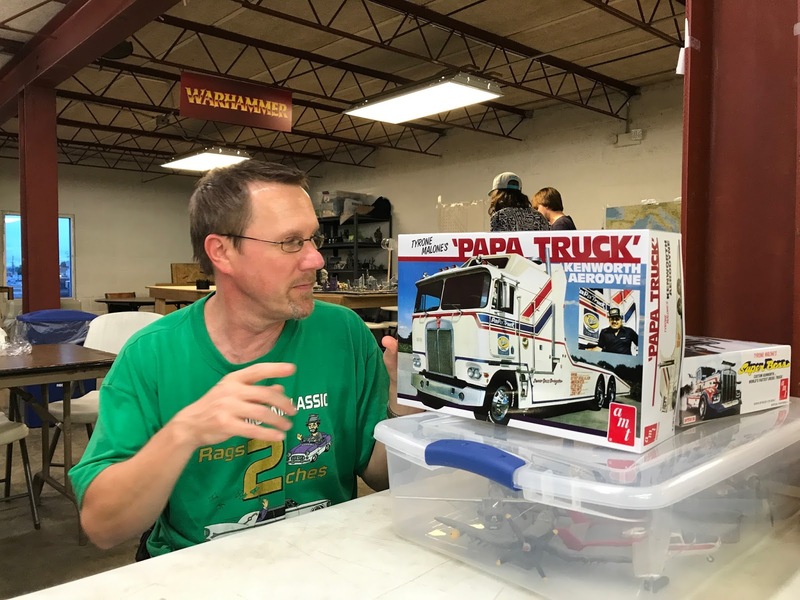 The subject of sponsoring a trophy package for the IPMS National Convention in Omaha, Nebraska has been dropped. Two members of HPMS have made efforts to contact the listed POC for the convention but there have been no replies from that individual. The chapter has been contacted by the Hamacon presenters to manage the 'Make & Take' the Saturday afternoon of the gathering. The chapter has a few kits left from last years function and has ordered more. We will not have a table at the Hamacon this year. The matter was discussed and it was decided that the ROI, new members, to HPMS, was not yielding the desired results. The July meeting of HPMS will be held on 3 July, 2017. 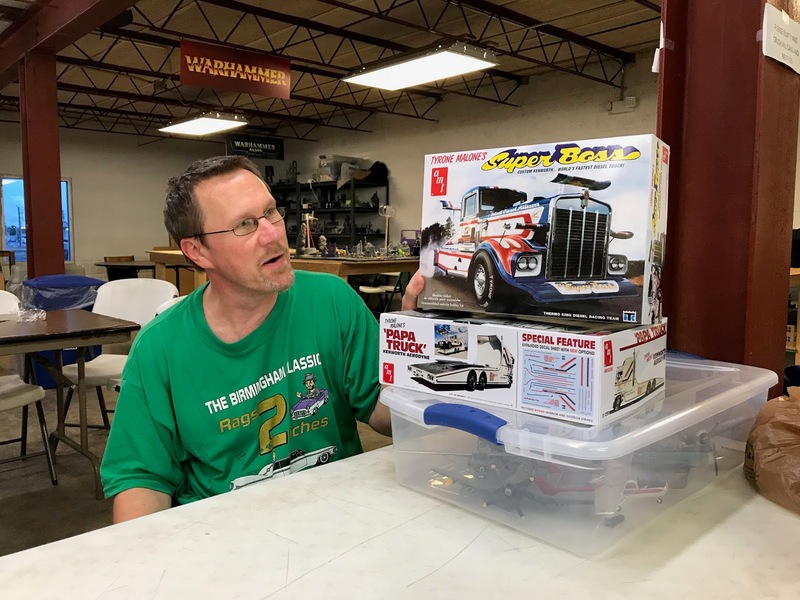 While this is the Monday prior to the Fourth of July the membership felt that for consistency we would stay with the first Monday of the month. M.E. 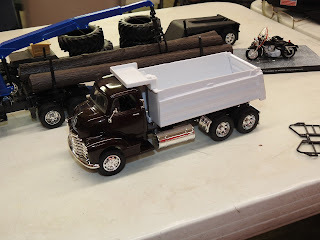 Mueller - 1/25th scale 1978 4 WD pickup. Replacement engine is from the 'Mod Box' and is also replacing the wheels and tires. There will be more mods coming. 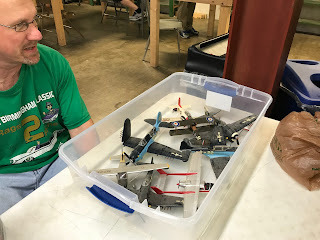 Andy Brezinski - A box of aircraft models, mostly 1/48th scale, from childhood, 'They still exist'. Also a 1/25th scale "Super Boss" truck kit and a 1/25th scale "Papa Truck" Kenworth Aerodyne. Trevor Bennett - 1/35th scale M-1A1 AIM Abrams tank. This is part of Thunder Run Museum project for the 3rd Inf Div. The tank is modeled after tank C-33 "Call to Arms". 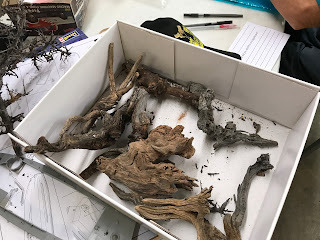 Ed Kiker - Brought in a box of wood, mainly tree branches, that were in rather interesting condition due to exposure to the elements, would make good components in a diorama. Tom Clark - Maschinen Kreiger kits, Nadesico resin vs injection kit. 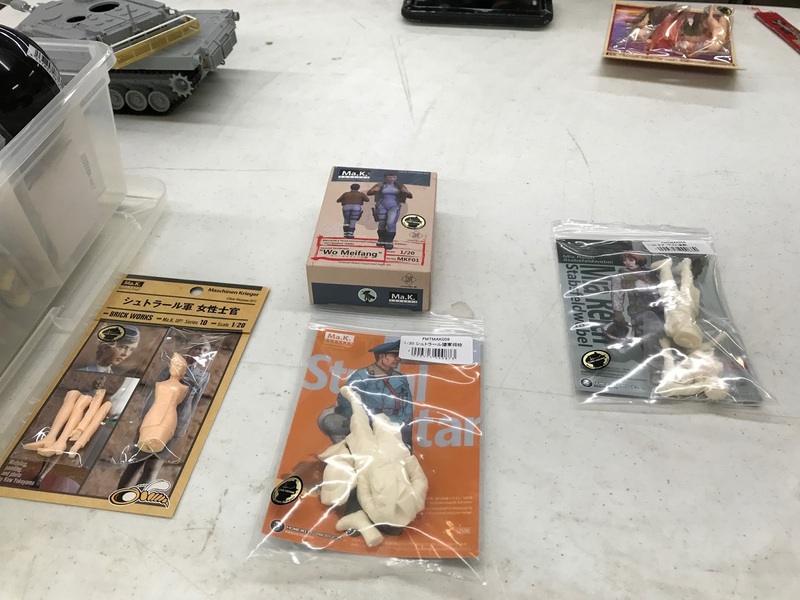 12 'capsule' Mak suits in 1/35th scale various types. These are a 'grab bag' offering, and some 1/20th scale figures for MaK.